Wat Bang Khae Noi is an absolutely striking temple that has entirely been carved out of wood. Everything right from the murals on the wall to the craft on the ceilings and the floor has been made out of wood and looks exceptionally beautiful. There’s a huge statue of Buddha while on the walls, his story right from birth to enlightenment and death has been portrayed beautifully in the designs. 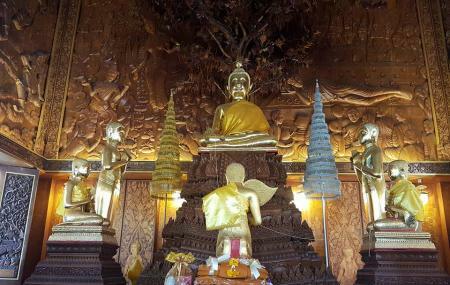 There’s a tree that stands tall right behind the Buddha statue and that too has been made out of wood. The people here at Wat Bang Khae Noi are very friendly and would in fact even point out to the hidden pictures in the impressive carved murals.